The primary goal of the Rotary Club of Guam during the 1978-1979 Rotary year was to assist the membership in gaining a deeper feeling for Rotary and applying the principles in their daily lives. This was achieved, to a certain extent, through the development of a most comprehensive weekly schedule of luncheon programs. This activity helped maintain considerable stability in high weekly attendance for meeting and membership. Few members left the Club during the year. Many good, ongoing activities of the Club were continued. Rotarians offered their assistance to the Junior Achievement Program, and the Club supported the expenses of an Achiever to the National meeting in Indiana. 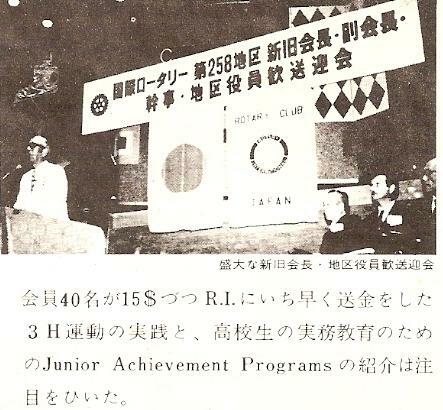 Through the club president, the concept of Junior Achievement was introduced to the president and group representatives among others during a Rotary International District 258 meeting held in Tokyo, Japan. The Rotary Club of Guam president spoke to the group on behalf of the other 83 incoming club presidents in the District. Other programs continued were scholarship, hearing aid, Girl Scouts of Guam, Sister Club Exchange (Student and Rotarians) with Karuizawa, athletic activities, and intergroup programs. Athletic equipment was sent to a neighboring, island in the Trust Territory of the Pacific Islands, a proposal to establish an international polo meet on Guam was approved and funded by District 258, and a physical fitness project within the Club proved to be very successful. Also, during the year, a special effort was made to inform the Rotaryanns about Rotary, by involving them in the planning of Club activities. Among key appointments made during the year was a chairman to head the publishing of a book titled Forty Years of Rotary in the Mariana Islands. Initial planning for the celebrating of the 40th anniversary in October of 1979 was established as were preliminary discussions in intercultural exchange program. Governor Kiyose, Governor elect Aoki, outgoing and incoming club presidents, other officers and rotarians. It is indeed an honor to have been asked by our Governor Jiro Kiyose, to address this distinguished gathering of Rotarians on behalf of the 83 incoming presidents from the Rotary Clubs of District 258. Knowing that there are as many as 6000 fellow Rotarians in our district from clubs in Tokyo, Okinawa, Saipan and Guam makes this occasion an even greater honor. Speaking for the incoming presidents, I would like first of all to thank Governor Kiyose and his staff of Rotarians who worked very hard this past year visiting each club in the district. 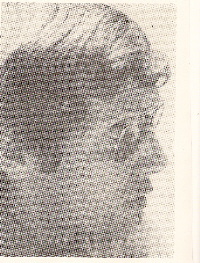 In particular I found our group eleven assembly, held in February, to be very helpful in planning for the 1978-79 Rotary year. The presence of both Governor Kiyose and incoming Governor Aoki made that assembly especially worthwhile. We wish to acknowledge Governor elect Aoki, by wishing him a very successful year as the Number One Rotarian in our district. We know that when he participates in Rotary international meetings and activities he will represent us well. We incoming presidents also want to thank the outgoing presidents. We watched them throughout the year and know that to be a Rotary club president is demanding, time consuming and often thankless. We will seek your advice and helping hand as we take over the leadership of our respective clubs. We thank you in advance for the help you will so kindly give to us. As presidents we look forward to a year of challenge. We know the task will no be easy. The direction has been set. The REACH OUT theme of our new Rotary International President, Clem Renouf from Australia, will serve as a guideline for our programs. We incoming club presidents fully intend to be good examples of what Rotary is. Although “no man is an island” we are not so naïve to think that our clubs will be able to have successful programs if we do not exert strong leadership. We clearly understand that if Rotary is going to REACH OUT to its members to keep them active, to the youth, to our communities and across international boundaries, we presidents will have to be the first to extend our “HANDS”. We will face difficult decisions just as the president of the Rotary Club in California this past year on the matter of membership. To face the challenge every president will strive to encourage strong, active participation in meaningful club programs and activities. Fellowship is an important part of Rotary; however it must never become the totally of Rotary to any member. We presidents must ensure that our clubs have worthwhile programs which will provide Rotarians the opportunity to grow and to bring them together through involvement and active participation. Our new Governor, Mr. Aoki, has made it clear that he intends to be readily available to offer his guidance. We thank him in advance for this. His strong insistence in calling for our participation in the very successful District Assembly held last month Keio Plaza Hotel was an indication of his desire to help us and to bring all 83 clubs in district 258 closer together. The eight of us from Saipan and Guam who met with you during the District Assembly were most appreciative of the special recognition we received as well as the opportunity to be able to feel and observe your enthusiasm for Rotary. The special evening meeting called for us by Governor Elect Aoki was appreciated too. During that meeting we and the group five representatives discussed problems and concerns that we have experienced, and our ideas and plans for the future. We even talked about the possibility of holding a District Assembly on Saipan or Guam some time during the next five years or so. Although some of you are aware of the history of Rotary on Guam, I would like to briefly mention a few important dates in its development, and a successful program for youth that our Rotary Club helped to established. Rotary in the Mariana Islands will be celebrating its 40th anniversary this club year. 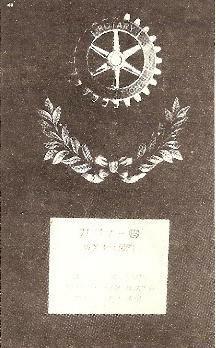 In 1939 Rotary was extended to Guam from Philippines. The conditions were right and Rotary became deeply rooted as an important service organization for men on the island. 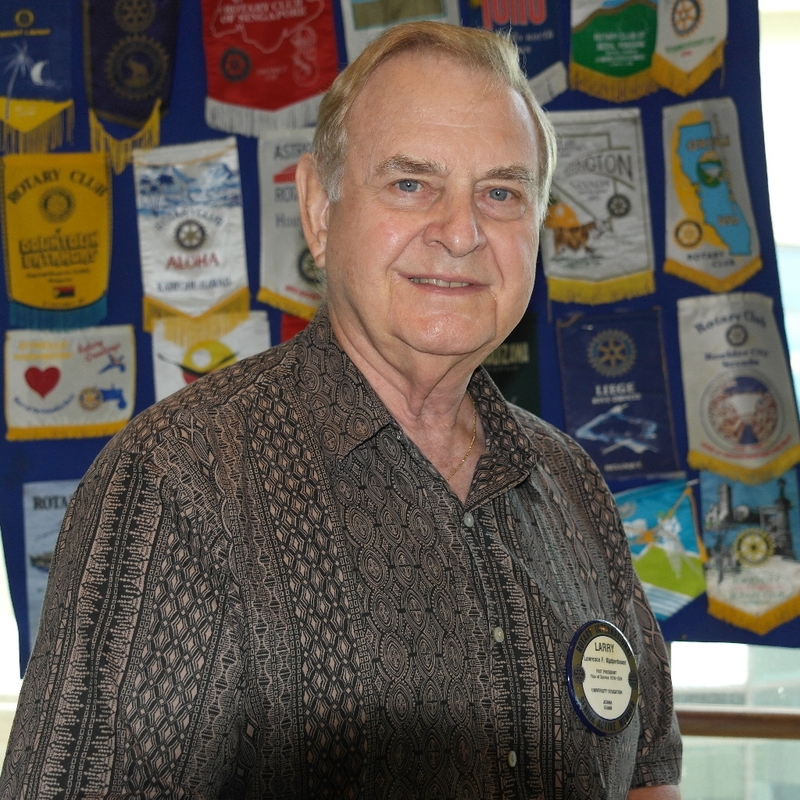 Rotary quickly developed but it was very difficult for the members to make up the weekly meetings that they missed. The nearest clubs were in Hawaii, the Philippines and Japan. 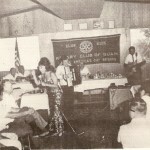 Finally in 1968, through my club, Rotary was extended to Saipan, an Island located 100 miles north of Guam. Rotary continued to grow in the Marianas Islands and the Tumon Bay Club was formed on Guam in 1972. Three years later, in 1975, the Rotary Club of Northern Guam began. Now there are three Rotary clubs on Guam with a total membership of about 175 and the club on Saipan with 35 members. This makes it much easier to make up meetings and we now have quite a few members such as myself with perfect attendance each year. Our Rotary Club of Guam operated as an independent club without a district until only six years ago. In 1972 the Guam and Saipan clubs became a part of District 358 which, of course, is now the Rotarians of District 258 here in Tokyo, Okinawa, Saipan and Guam, we represent a unique District. International relations automatically becomes a way of life for our clubs when we work together. Mr. Aoki, our Governor Nominee, has encouraged our Rotary clubs to work together. His theme concerns YOUTH. Our clubs should have strong programs that reach out to the young people. The Rotary clubs on Guam have emphasized the importance of youth. 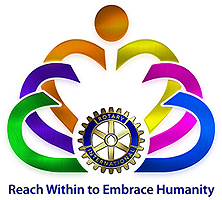 Through Rotary we developed a special youth program. It is the Junior Achievement Program which is for boys and girls in High School (about 15-18 years old). It has been a very successful program on Guam since it began three years ago. It is also very successful in the United States. Through the Junior Achievement Program the youth learn about the free enterprise system by actually forming a business. Then they produce and sell their products, Rotary clubs can sponsor such a program and Rotarians as businessmen can serve as advisors to the youth. We would be very pleased to have our Group Eleven Representative, Rtn. Allen Pickens, or one of us explain the program and share our experience with you. We Rotarians of Saipan and Guam invite each of you and your club members to visit our island during this important Rotary year. We welcome you to our Rotary meetings and to observe the Junior Achievement Program in action. We would also be pleased to have the opportunity to show you our tropical islands. I know you would enjoy the year round warm weather and our many tourist and business attractions. In a few more days we will officially assume the duties and responsibilities of our new positions in Rotary. With the guidance of our new Governor and his staff, and the continuous support from our past Governor and club presidents, I know that we all can look forward to a productive and rewarding year of leadership in Rotary. In closing, I wish to thank Governor Kiyose for asking me to speak today. I hope that what I have said conveys at least in part the thoughts of each and everyone of the 83 incoming presidents of District 258. PP Larry advised that the occasion of the above address was the first highlight of his administration as it occurred a few days before he took office, when he attended the District meeting for outgoing and incoming Presidents, Secretaries and District Governors. During this administration, PP Larry received the “Governor’s Prize” on behalf of the Rotary Club of Guam for the most outstanding Vocation Service Project. 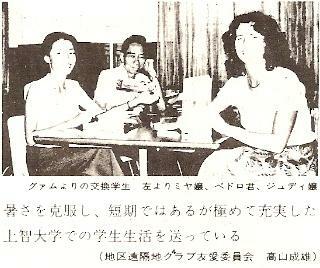 GOVERNOR KIYOAKI AOKI Awarded to the Rotary Club of Guam and received by President-Rotarian Larry Kasperbauer on March 19, 1979 at the Tokyo-Prince Hotel, site of the Annual Conference. The Rotary Club of Guam was selected by the Governor and his staff as the Club out of the 84 clubs in District 258 (included the three Clubs of Guam, the Saipan Club, and the Rotary Clubs of Okinawa and a part of Tokyo) with the most outstanding Vocational Service Project. The award was given for the JUNIOR ACHIEVEMENT PROJECT which was initiated by the Rotary Club of Guam several years ago and supported continually since then. A color pictorial display of Guam Junior Achievers in action was on display throughout the Conference. 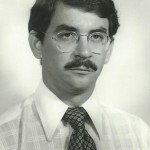 In November 1978, a proposal was submitted to the District for funds to initiate a water polo project. Funds were subsequently received from the District to develop an international water polo program, and shortly, there will be an international water polo tournament involving teams from Japan, Guam and other countries. In December 1978, the Rotary Club of Guam donated $100 for the purchase of athletic equipment such as baseballs, gloves, and catcher’s gear for the people of Truk. Wolff, who is UOG Tritons baseball coach and the Pacific representative for Sports Ambassadors, a Christian athletic group, received the written shortly after the Ambassadors played a baseball game against the Trukese All-Star last June. Rotarians Bill McAlister last received a similar request for assistance. Guam Rotary Club President Larry Kasperbauer last week announced that a $100 contribution had been given to Wolff for purchase of baseballs, gloves and catcher’s gear. In addition, the GML is donating two dozen baseballs and Mark’s Sporting Goods is contributing $25.00 worth of equipment. Wolff, who is personally donating some bats, balls and gloves as well as the fare to deliver the equipment to Truk, has launched a “Micronesian baseball Association” to promote baseball throughout Western Pacific islands. Present plans call for the following Micronesian baseball competition starting with the Palau Baseball Association inviting the GML All-Stars to Palau this spring to inaugurate their new stadium. The University of Guam hopes to raise enough revenue from its second annual Goodwill International Tournament (June 1-3) to compete on Saipan after Saipan’s new baseball stadium is completed. Wolff recommends that all districts consider sending a baseball team to Fiji for the South Pacific Games competition. Although baseball is not now an officially sanctioned Olympics sports, it probably will be in the future, he said. The Micronesian Baseball Association plans to host a Micronesian Games (in baseball) on Guam sometime during 1980. Anyone interested in helping promote baseball may contact MBA through Pat Wolff, P.O. Box CE, Agana, Guam 96910.